an exciting and innovative training experience. DRUMBEAT.corp™ is designed especially for executives and management. It harnesses music and rhythm with a strong emphasis on building better relationships. DRUMBEAT.corp™ explores themes such as teamwork, workplace harmony, company values, individual strengths, communication, risk and creative responsiveness. DRUMBEAT.corp™ can be tailored to the needs of specific organisations and utilises experiences drawn from participants’ own work lives to find solutions to workplace challenges and to promote behaviour change. This professional development experience will challenge participants while at the same time leaving them more closely connected, more insightful, and full of positive and creative energy. More than just a fun drumming program, DRUMBEAT.corp explores corporate themes at a deeper level with facilitated discussions by experienced facilitators. These sessions are generally half day or full day sessions with small groups. 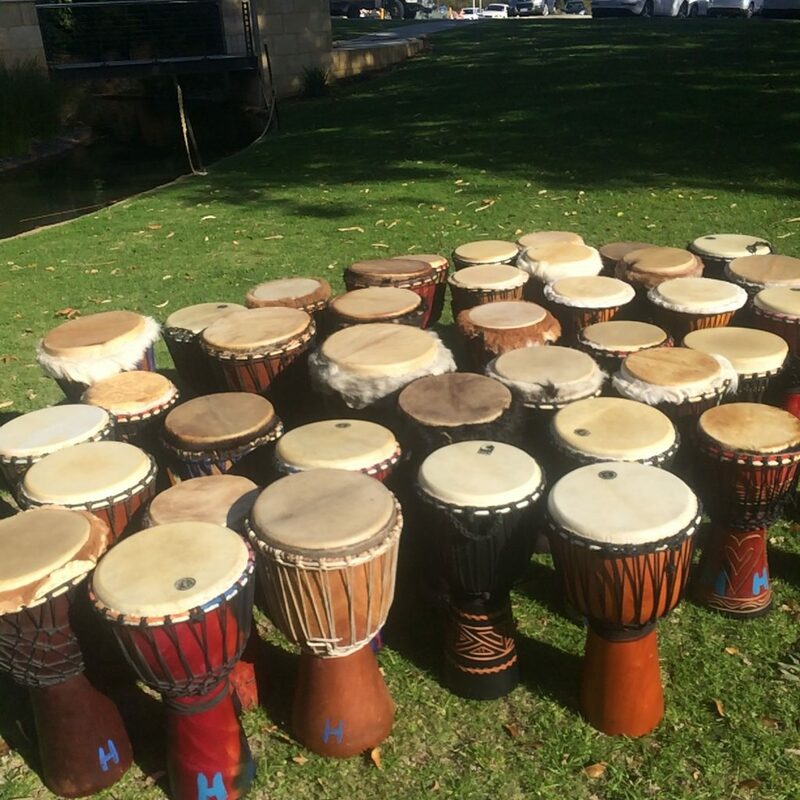 “Our WA leadership group recently had the pleasure of being active participants in a tailored DRUMBEAT.corp leadership experience. In an idyllic setting and in partnership with Fran and Beth from Alive & Kicking, we found the afternoon to be extremely engaging particularly as it enabled all participants to be on an equal footing and truly share their leadership challenges in an open and non-judgemental way. DRUMBEAT.corp – what it can accomplish. The applications for this training tool are truly unlimited! 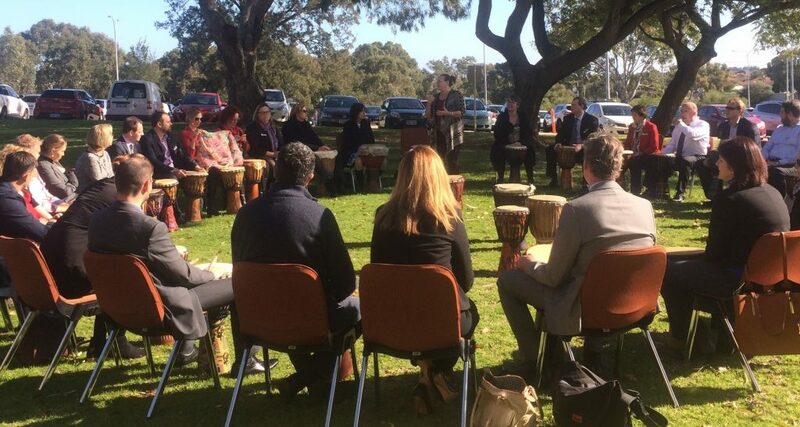 Drumbeat lends itself as a metaphor of experiential learning for every area of our corporate life. Everything in life has a natural rhythm. Some are quick, some slow, some predictable, some erratic. When we begin to form a culture in society, and organisation, a department, a team, or a family unit – we begin to establish a natural rhythm. If the rhythm is left to its own devices – it can become unpredictable and uncomfortable and not serve the team well. If the overall rhythm is too slow, we are not accomplishing our goals in a timely manner. If the overall rhythm is too fast, then we will lose quality people along the way through burn-out, stress and fear. What if a leader’s rhythm is too fast for her team? Now we have a system that is “out of sync” – and there is discord and mismatch of all types. DRUMBEAT.corp can help people to explore their natural rhythm – and also give insight as to how to change that rhythm when and where necessary. It gives us the ability to be nimble and adaptable! The way we do our business DRUMBEAT.corp can be used to explore systems. How systems get created, how they are engaged, how and why they break down, change processes. This one is a very big topic to be explored. How to be nimble DRUMBEAT.corp is exceptional for this issue. Adults generally do not start out as “nimble” in our behaviours. We like to have a “comfort zone” in which we operate – and we are capable of being nimble within that comfort zone. When we are asked to stretch, change, behave differently, and go outside of that comfort zone, we often become “inflexible”, and everything slows down as fear and caution arise. What is needed is a pathway to become nimble. This is a habit structure. DRUMBEAT.corp is a wonderful way to explore what it takes to create habit structures that allow us to become nimble – and that process then becomes procreative and generative over time. Taking reasonable risks Most people are not accustomed to drumming. This process is almost always uncomfortable for people – especially if they are asked to “perform solo”. DRUMBEAT.corp is a wonderful metaphor for exploring risk taking, and how different individual approach this process. It provides a brilliant opportunity for people to explore boundaries, what is reasonable, what structures are available to help for those who are quite risk averse. Being more collaborative DRUMBEAT.corp is brilliant at demonstrating collaboration and support processes. There are so many wonderful drumming games that engage “team practice” from all different angles. or email jo@aliveandkicking.com.au to find out more.